“Lot 41025 in Heritage Galleries May auction is a 1.75” rhodochrosite crystal on quartz from the Sweet Home Mine. It’s estimated at $350,000-$425,000 and has a reserve of $388,000 with the buyer’s premium. The same specimen was offered in 2001 as lot 47 in the famous Freilich auction where it fetched $35,350." I’m not a connoisseur but based on the two photographs it doesn’t look like a great rhodo and in fact Freilich lot 48, a smaller rhodochrosite on quartz, brought triple the price. I know rhodochrosites have gone up a lot since 2001 but I’m surprised they are estimating this will bring 11 times the 2001 price in this economy. Have similar specimens sold anywhere close to this price or are they just hoping someone will bite? I keep track of all the auction price data and other sales data I can get my hands on. The Heritage auction prices have, at least for the last two years when I have been keeping track, been in many cases out of line with the prices paid elsewhere. This is especially true for the nicer pieces. I am not sure what it means or why this phenomenon occurs. I have also with interest followed the development of a very high-priced market segment for a special type of mineral specimens. The Heritage auction located in Dallas (which is probably no coincidence ref. the recent supplement to the Mineralogical record) is an active player in this field. For most of us minerals represent a past-time/hobby/passion or field of scientific interest - but there are also many serious dealers who try to make a living from the selling of specimens. In most commercial areas customers may be more or less unaware of the marketing strategies that also govern pricing. This is also the case with mineral collectors who often believe there exist some kind of "fair" pricing based on a percentage markup from the original purchasing price.This may be the case for groceries and simple commodities, but is not relevant in the area of collectors`items and art. It is quite legitimate for any vendor or business to develop strategies to better sell their products and increase profits. Very often behind-the-scene alliences develop targeting specific customer groups or market segments. There has allways been certain mineral dealers catering for a high-end customer group but until about 10 year ago this group was quite small and could not sustain many dealers. Maybe in part as a result of the financial bubble giving surplus wealth to many new individuals and also the internet where the aesthetics and value mineral specimens are more visible to the general public, a new group of collectors have been attracted to minerals both as collector`s items, decorater and trophy objects and as investments. We have witnessed a number of rapidly expanding dealers focusing on this market segment. You can see most of them at the Westward Look mineral show inTucson which also emerged as a new high-end venue in this period. Public auctions have allways been an important market place for expensive art and collector`s`items like stamps, coins, dolls and antiques. The auction houses always look for new product groups that migth attract their high-bidding customers. This has esepecially been the case during the last two decades when many of the best pieces of art and antiques having setled in private and public collections. There has clearly been alliences forged between many of the new high-end mineral dealers and the auction houses like Heritage Auctions to try to establish a larger market for mineral auctions. Because many of the potential customers at these auctions may have more money than knowledge of minerals, the pricing and especially the perceived rapid appreciation in value of the high-end specimens is of prime importance. I am quite sure that when the price estimates are set for specimens that have been up for auctions or public sales some years ago, the new price estimates are also motivated by seducing wealthy customers to believe that this new area of investment has a large potential for further increase in prices. With banks going broke, stock markets crashing and prices of gold on the rise, many people will consider putting their surplus cash in objects that can be expected to appreciate more than products in the rotten financial sector. Such business strategies are completely legal and I have no moral objections either to the in my mind absurd pricing of certain mineral specimens at auctions or by dealers. I am more concerned about the rising prices of bread and corn for the millions of poor and starving. Nobody needs to purchase an expensive mineral specimen or a 100 mill $ painting by an old master for that matter. I think the majority of us can enjoy minerals at our level or budget whatever prices estimates or final selling prices you might see at the Heritage auctions. I know of a very wealthy former art dealer who has recently developed an interest in nice mineral specimens. She knows that she is wildly overpaying for mineral specimens, but since mineral prices are so much less than what she would ever pay for a painting, it doesn't matter that much. Buying minerals is a safe interesting distraction while the art market corrects. The Heritage auction located in Dallas (which is probably no coincidence ref. the recent supplement to the Mineralogical record) is an active player in this field. I haven't a clue as to why the area Heritage Auction house is located is related to the supplement of the MR.
Dallas is the 5th largest city in the USA. I have been to a Heritage Auction reception, and although the minerals were very nice they were best offered to newcomers and foreign enthusiasts, most of which do their bidding online or by phone. I have a friend, not from Dallas, that went to the actual auction and said the lesser known and less expensive minerals could be purchased at a more than reasonable price and it was the big and flashy minerals that he felt were typically over zealously priced and bid on. After all, it is a competition that people get caught up in. I have seen the same thing with live auctions at mineral gatherings, gala balls, church groups. It is the silly competition that often drives people to over bid. I doubt many of the bidders actually go to shows. And what Dallas has to do with it is beyond me keldjarn, what an odd statement. I think it's obvious to most that, in recent years, an increasing number of people with large disposable incomes have gotten into the mineral collecting hobby. This has certainly changed the dynamic of the marketplace. I suspect that many of these folks have neither a lifetime of experience in mineral collecting nor any academic background in geology or mineralogy. Like many in the hobby, they are simply interested folks with a collector's erge and some money to spend. For these novice collectors, I think there is a natural tendency to focus on "greatest hits" of the mineral world when trying to build what they think will be an important collection. In fine arts, everyone recognizes names like Van Gogh, Rembrant, Picasso, etc., and even those without much knowledge of the art world are likely to recognize these as desirable things to have in an art collection. The same holds true for minerals. Any neophyte who pays attention will quickly realize that certain things like a Blue Cap tourmaline, a Bisbee azurite or a Sweet Home rhodochrosite are highly sought after items, and the logical conclusion is that one should have these things if one's collection is going to be recognized by one's peers as good. Hence the rapid appreciation in the price of these things. Auction houses play a big role in "making the market" for many collectibles as the price that items sell for is on public record. 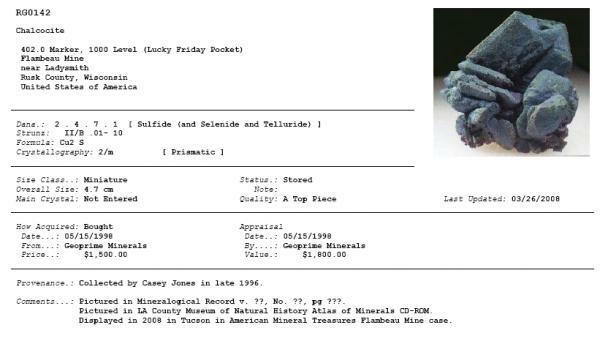 If a large flashy rhodochrisite is known to have sold in 2001 for around $35,000 and the auction house offering the same one for sale in 2009 can suggest that its value has increased ten-fold in that time period, this tells the potentially interested bidders that it must be a very good investment to have appreciated that much in such a short time period. If someone believes them and puts up that sort of money to have it, then they have set a president that suggests not only is a good Sweet Home rhodochrosite worth this much, but that fine mineral specimens overall may well be, also. In a sense, they have "made the market" for these things by demonstrating to the collector community that these are good things to put your money into. Auction houses for high-end collectibles are always found in major metropolitan areas like New York, Los Angeles, and Dallas as there are high concentrations of wealth in these areas. One goes where one's customers are. Simple as that. That's a very good point. 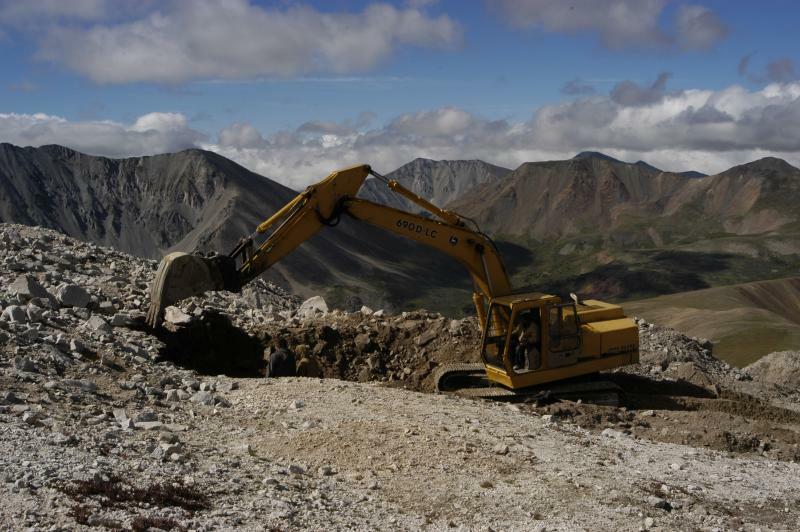 The high estimate implies minerals are very expensive as well as great investments. Even if the rhodo doesn't sell, it implies the consignors other items are worth more and in fact seem cheap by comparison. I agree that some of the Heritage items are reasonably priced and I've bought a couple of mid range things at their auctions. Jesse's point is well-made. The knowledgeable collector buys the best thing he can afford, be it a Hotazel rhodochrosite (Whey didn't I buy one when they first showed up?? ), or Pakistan aquamarine, whatever. However, the entry of people into the hobby with substantial disposable incomes has raised the bar considerably. As I said before, it's the power of legitimacy. A price tag legitimizes the amount asked for the specimen. And paying the ridiculously high prices asked for some specimens only further legitimizes the lunacy. So you do the best you can, buy what you want to because it makes you happy, you take the specimen home and bond with it, put it on display with it's siblings, whatever floats your boat. Usually, when I purchase a mineral, I know precisely where it will fit in my display. Like "Oh yeah, that'll go in the north Waddell case, 3rd shelf, right next to the red beryl. It'll be a nice contrast.". And the deal is done. Sometimes one has to pass on a piece because it is simply out of reach. In these hard economic times, I'm not interested in taking out a 2nd mortgage to float the acquisition of a premium specimen. I save money all year long, put it away for Tucson, and buy what I can with it. Sometimes it depends on what kind of a year I've had. And, given that my income is usually tied directly to the price of gold, or silver or uranium, whatever commodity is sought after by my client(s), my year can be really good, or sometimes really bad. Rock Currier taught me this: You collect for yourself, you pick up things that are pleasing to you, and call it good. I no longer eye a piece wondering say, how many points it might get me in competition. For a while there, that parameter was significant. I remember when Marty Zinn put together a beautiful suite of minerals that all cost $100 or less. It was pretty impressive. So I collect for myself, and pick up the things that catch my eye and call to me. Enough rambling. I am enjoying everyone's input and their various reactions which seem to range from total sticker shock bordering on buyer's remorse to those who seem to be oblivious to the upward spiral in pricing. Keep weighing in, everybody. Ed wrote: "A price tag legitimizes the amount asked for the specimen." In the eyes of much of the public this seems to be sadly true. More than once I've seen the following scenario at a show: child excitedly points at a label and says "Look Mom, that rock is worth $25,000 !!!". And I think to myself, what does "worth" mean here? If I write $1,000,000 on a label, does the piece miraculously acquire that value? Nevertheless, the mothers usually respond with something like "Come along now, Jimmy, we can't afford that." Never once have I heard a parent say, "No, Jimmy, it's not worth that much; that's just an imaginary number on a label." So our young people grow up mistakenly thinking that price asked = value. Pehaps we need economics classes in elementary school. In a consumer-driven economy such as ours, the asking price, unfortunately, has become the default equivalent for value as most folks do not have any other way to gauge the true value of what they are offered for sale. If they decide to teach economics in elementary school, they should also teach the art of negotiation. For every instance where an overexcited buyer overpays for a "great" specimen (be it justified or misguided), there's at least one other where the buyer turns away from a seller's wares because he/she can spot overly inflated prices and is not skilled in haggling (like me) - or because the high prices are, simply put, a turn-off. Who knows, maybe the economic downturn will prompt the people with too much play money (parahrasing loosely) which were discussed previously to be less spontaneous in their purchases and will so some homework to become more discriminating - ? And then maybe the spiraling prices will start to level off - ? I digress from the core of the topic and apologize, but the thread is really interesting and I spotted an opportunity to chime in, in a small way. Good one Tracy. And you too Alfredo. Les Presmyk has a polite way to put it. Sometimes a piece is "Aesthetically challenged". I like that, aesthetically challenged indeed. When I travelled through Mexico acquiring specimens for Miguel Romero, I would often face challenges such as the language barrier (well, at first), and then the conversion rate (Let's see, how many pesos to the dollar? OK, times 8.5 (or whatever)), things like that. Eventually I learned that it boils down to this. I hold a mineral specimen in this hand, and in the other, a wad of pesos. How many of these pieces of paper will I give up for this rock? No price tags, no previous history for the specimen, no pedigree, just the fresh-out-of-the-ground specimen and the dinero I carried. And of course the final decision came after a bout of negotiating. Had to do it, the negotiating, or else they wouldn't respect me. And it is expected. So I'd make the decision, Yay or nay (Yeah or neigh?) and get on with it. Miguel always liked the things I reurned with, and I found him some real oddball things in Mapimi, so.... It was very similar to what Dudley goes through when he buys specimens in Pakistan and so forth. I can really identify with his adventures. Yes, you went right to the heart of it when you said a price tag is just that, a piece of paper with the dealer's idea of what he thinks he can get for the rock. Sometimes the price is reasonable, and represents a profit for the dealer after his costs to acquire the specimen are factored in. Things like airfare, vehicle rental, guide services, lodging, meals, all the expenses that are incurred when one buys things at or near the point of origin. Sometimes the acquisition costs are more subtle, particularly if the specimen has a history, having belonged to a reknowned collector or institution. This of course goes to the provenance of the piece, and there may be factors involved that are beyond the ken of the buyer, depending on his/her depth of knowledge. Usually, in cases like this, the specimen will cost more, and that is to be expected. I look forward to the responses this diatribe is sure to generate. I like champagne, but I often find that I like the less expensive brands, they rival those of much higher costs. But, in all fairness, it is fun to have a very expensive bottle of champagne for very special occasions. It IS okay to enjoy something based on how others perceive it too. And there is a certain fun aspect to being decadent just once in a while, isn't there? I see people at live auctions, they win something and they have enjoyed the competition, the thrill of the challenge, and the fact that they "fought" for what it is they won. There's a certain amount of "feel good" that goes with auctions. Perhaps later, when the smoke has cleared, they will think they paid too much for it, or not? I say let people enjoy their hard earned money and do what they will with it. Absolutely Gail, that's the point. I know that you love your minerals so much that you have them on display in your living room. So does Bill Larson, many others. And what you say goes to the old saying about how "The bitterness of poor quality remains long after the sweetness of low price has faded". The discussion began with a few notations on the Heritage auction, and how many of the things in the auction were, as I heard one collector comment "Loaded to the max, and beyond.". That's all. Someone posted that he had bought some things in the auction that were more reasonable priced. Those of us, like you and Jim, who have chosen our objects wisely, appreciate all of them, regardless of price. Of course, reading your string from Rochester, you are one of the few people I can think of who can have her cake and eat it too, and then re-donate it for a good cause. I think that's great. So yes, you're right, absolutely right, everyone should enjoy their hard-earned money, and do with it what they will. It's what I do. Thank you so much for the Rochester Symposium string. You've given the people who were unable to attend a good sense of the event, and I applaud you for it. I love you, you are such a smooooth talker! I really don't remember who ended up with the bowling ball topaz and accesories, IE the beer cans! It was such a feverish bidding time that I was tired of twirling around in my seat to see whom had outbid whom. It was all in good fun though, and Jim and I ended up with some fabulous Quincy mine stock certificates and old cheques, etc. We also won sponsorship on Mindat of a mineral page of our choice. A few mineral specimens..and a rather male looking pyrite complete with the "boys". As I said, all in good fun! Wasn't it Sarah Hanson who ended up winning the topaz and beer cans? Thank you Gail. Enjoy Houston, and we all look forward to your write-up on the show. Say Hi to Karl for me, and tell him that I'll have the Romero label off to him on Monday. Wish I could be there in Houston with everyone. I'm hoping that one of the old-timers, someone with a better memory than mine, can shed some light on the old auction specimen with the stunning lineage and humble appearance. People should spend their hard earned money anyway they like and auction fever is very exciting, but isn't the real point a lack of accurate information ? We love our minerals but would anyone buy a rock for $10,000 if they knew similar specimens they liked just as much were available for $1,000? This is a free market and "buyer beware" is definitely operative but for those collectors who don't attend the shows or know the players , it's hard to get any kind of accurate pricing information . In this case the only information readily availble was an "estimate" that was misleading at best. Transparency is always good and the more accurate information available the better. Rocknut, mineral specimens enjoy a "free market", but not what economists call an "efficient market", for precisely the reason you point out: Lack of information about how many specimens are actually available, and what they actually sell for. The "law of supply and demand" works well only when one has access to all the necessary information - which has improved a lot since the invention of the internet, but for minerals is still far far from ideal. Especially at the high end of the business there is a lot of "smoke and mirrors" - minerals shifted around between dealers, giving the impression that the market is more active than it really is. And of course, dealers themselves suffer from the same lack of information at their sources. I can't count how many times I've overpaid for some allegedly very rare specimen in Bolivia, only to find out that there was a ton of the same material available the next week. I'll bet that Ed has had similar experiences in Mexico, and Jordi in Rumania. The uncertainty is, perhaps, one of the factors that makes this hobby so much fun. ...like gambling in a casino; it's a game. In Rumania, Panasqueira, Morocco and (sigh) in Spain too... in fact in every place. Miners are not idiots and if they can see that (for example) one Pyrite which normally it should worth at (grand maximum) US$100 is sold for US$10000, what do you suppose they will do?